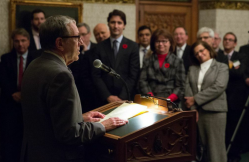 Mount Royal MP Irwin Cotler thanks the Wallenberg Foundation for honouring him, as a cross-partisan crowd, including Liberal Leader Justin Trudeau, showed a rare level of respect. Irwin Cotler’s resume would need book binding were it to list all the honours received by the Mount Royal MP. Yet, the Raoul Wallenberg Centennial Medal, presented to him last Tuesday on Parliament Hill, was special. Wallenberg, the Swedish diplomat who saved tens of thousands of Jews during the Holocaust, is Cotler’s life-long hero. The cross-partisan crowd at the Centre Block ceremony showed the rare level of respect Cotler commands in Ottawa. Andrew Scheer, Speaker of the House and a Conservative MP, told the audience that Cotler is a model for Parliamentarians. Scheer added his unique perspective as the person responsible for keeping order in the House during Question Period. After announcing in February that he will not seek re-election, Cotler’s final term in office has something of an air of a great athlete’s final season, where he is honoured even in the buildings of opposing teams. John Baird, foreign affairs minister and fiercely partisan Conservative MP, attended and spoke at the ceremony, despite the fact that he was hosting his American counterpart that day, US Secretary of State John Kerry. Baird, who values Cotler’s advice on international human rights issues, joked that he spends more time with the Liberal MP than he does with his own family. Historian and academic Irving Abella and Liberal Party leader Justin Trudeau were among others who spoke. Cotler told the Jewish Tribune the ceremony gave him the chance to again publicly ask Russian President Vladimir Putin to open the archives and finally resolve what became of Wallenberg after his 1945 arrest by the Soviets. Meanwhile, Cotler said, he will continue to be inspired by Wallenberg’s legacy.